Practice sending and receiving code. 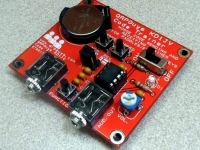 Steve Weber, KD1JV has designed a inexpensive device to help you learn or improve your cw skills virtually anywhere. We are calling it the KD1JV Code Trainer. You can practice receiving code at 5-30 wpm just about anywhere. It is small enough to slip into your shirt pocket and using some ear buds, you are good to go. 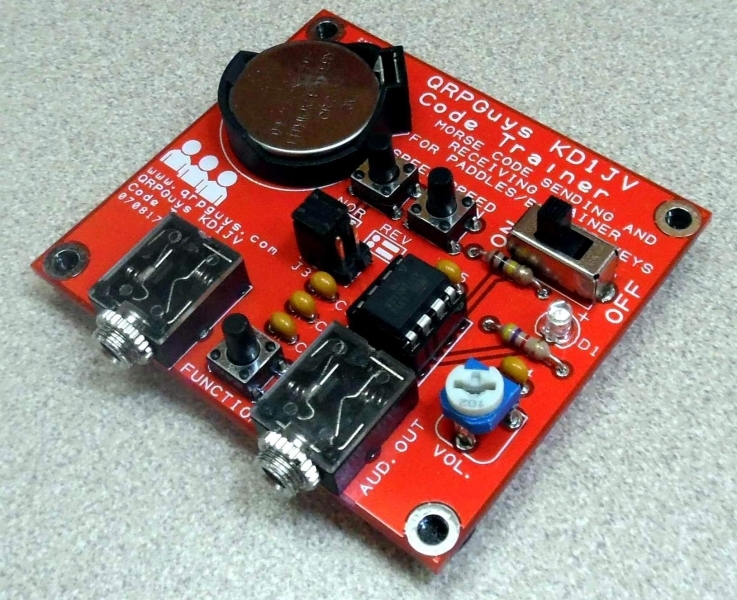 It is small, highly portable, and runs on a simple coin cell. 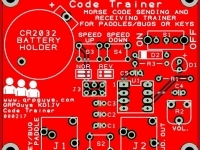 The device uses an Atmel ATTiny13 microcontroller. There is also an led that will flash in receive and send mode as code is generated for hearing impaired users. The receive function sends random five character mixed letter, number, and punctuation code groups. There is also an optional setting for Farnsworth character spacing. 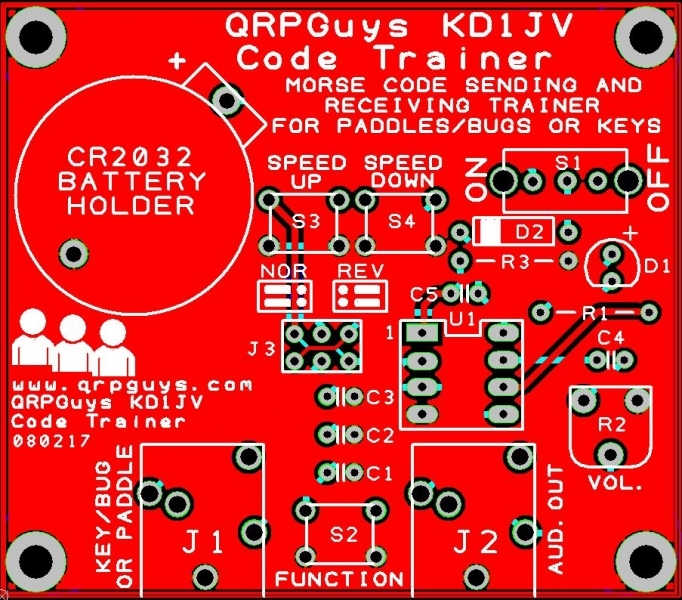 The send function works as a normal code practice oscillator, but accepts either a straight key, bug or paddle. For paddles it uses Iambic keying, with an adjustable speed range of 5-30 wpm. There is a jumper block to select either normal or reversed paddle side preference. It has auto-sense on startup that automatically detects either a straight key/bug or paddle connection. Adjustable gain on the output will drive a small speaker, earbuds, or with a simple cable you could attach one of the many external speakers now available for larger group use. The standalone through hole kit has all the components except a user supplied CR2032 coin battery that mounts in the pcb battery holder. On a difficulty scale of 1 to 5, 5 being the most difficult, this is rated at 2. Assembly time should be less than an hour, depending on experience.